I (and Global Spin) have changed a bit over the last few months. Nothing you’d notice much, but I’ve set aside a few projects and picked up a few others. Specifically, I’m starting the long road toward becoming a licensed scientician. Long story short: Global Spin is shifting towards science blogging. For the remainder of 2011 I’m going to post something sciencey once a week, probably on Tuesdays. Older posts will still all be here; in fact, I’ve fixed the archives list in the sidebar so it shows posts going back to 2003. However, the focus going forward will be on science, culture, space, and technology. Those four categories catch most of what I’ve posted in the last two years anyway, so it won’t be a big shock. I’ve also streamlined the site a bit. It’s not a community place anymore; social-media sites are much better at that now. It’s not even a place to store my personal commentary on the rest of the web; Tumblr and Twitter and Reader (oh my!) fit that need nicely. One thing I’m going to try (and maybe go back on): I’ve turned off comments on these posts. Again, most of the commentary seems to happen elsewhere, so having those empty boxes at the bottom of each post seems a bit archaic. If you disagree, contact me and I’ll reconsider. The motto hasn’t changed, though: We still protect our freaks. 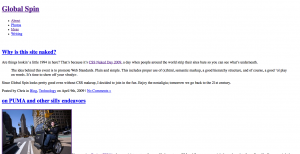 Why is this site naked? Are things lookin’ a little 1994 in here? 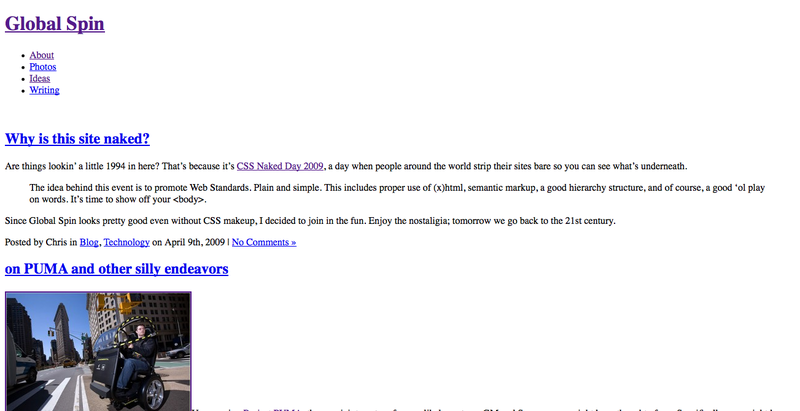 That’s because it’s CSS Naked Day 2009, a day when people around the world strip their sites bare so you can see what’s underneath. Since Global Spin looks pretty good even without CSS makeup, I decided to join in the fun. Enjoy the nostaligia; tomorrow we go back to the 21st century.